Support from the James Graham Brown Foundation, Kosair Charities, the Louisville community and the University of Louisville’s President have fostered the emergence of a leading Cancer Center that is making critical contributions to clinical care in the region and, through pioneering research, to cancer patients throughout the world. Much of the research that has been performed in our laboratories over the past 15 years under Dr. Donald Miller’s leadership is reaching clinical trials in humans, where new cancer drugs and diagnostics are being tested. The goals of our groundbreaking translational research programs are to bring laboratory discoveries to patients in the clinic. Identifying, developing, and rigorously evaluating new tools for the treatment and detection of cancer by expanding research in experimental therapeutics. Strengthening cutting-edge research in tumor immunology, which harnesses the power of the immune system to fight cancer. Building a program in cancer prevention and control to identify lifestyle, environmental, and genetic factors that influence cancer susceptibility and progression. Introducing promising drugs, vaccines, and diagnostic procedures directly to patients through clinical trials. Across the United States, earlier detection and improvements in treatment have increased the five-year survival rate for cancer patients to 68 percent, from just 50 percent 30 years ago. Although cancer deaths are on the decline, Kentucky still has the highest cancer death rate in the nation. Furthermore, the state’s rate of new cancer cases — an estimated 25,000 in 2014 — is the highest in the country. Because Kentuckians bear a disproportionate burden of cancer, the JGBCC focuses on research with the potential to rapidly translate laboratory findings into medical practice, where patients can benefit from effective new therapies. The emphasis on translational research has created one of the most robust pipelines of anti-cancer drugs of any American cancer center. JGBCC basic and clinical researchers have participated in more than 500 clinical trials, and more than 30 novel therapies are currently in preclinical development in JGBCC laboratories. For patients with advanced pancreatic cancer (stage II and III), the average survival rate in the U.S. within five years of diagnosis is 5.3 percent. But at the JGBCC, five-year survival rates for patients with advanced pancreatic cancer are 10.8 percent — more than twice the national average. Similarly, for JGBCC patients with advanced rectal cancer (stage II and III), the five-year survival rate is 68.9, nearly 18 percent higher than the national average of 58.5. Survival rates at the JGBCC are also higher for patients with curable breast cancer (87.3 compared to 85.0 nationally) and brain tumors (two-year survival rate of 33.7 compared to 31.6 nationally). The JGBCC’s renowned successes in research and patient care have allowed us to raise $195 million in philanthropic support since 2000, including more than $50 million from the James Graham Brown Foundation and $12.5 million from Kosair Charities. With its national reputation for innovative research, the JGBCC has also secured support from organizations outside of the Louisville region. For example, the Helmsley Charitable Trust has donated more than $9 million to support research on plant-based cancer treatments and vaccines. And in the past year, the JGBCC also netted three prestigious multimillion-dollar grants from the National Institutes of Health. This unprecedented level of support has transformed the JGBCC from a small patient care facility to an academic cancer center with a national reputation for innovative research. For decades, academic researchers and their counterparts in the pharmaceutical industry have focused much of their efforts on developing anti-cancer drugs that target the downstream effects of cancer-causing genetic mutations. Unfortunately, almost none of the drugs developed within this framework lead to a lifelong cure. Most cancer cells are inherently genetically unstable and eventually develop additional genetic mutations that subvert a drug’s activity. Under the direction of the new Director, Dr. Jason Chesney, JGBCC scientists pursue a very different strategy. Instead of targeting the genetic mishaps that induce cancer, researchers at the JGBCC investigate chemical reactions shared by cancer cells that differentiate them from normal, healthy cells. For example, cellular metabolism — the process that creates energy and building blocks by which cells grow and proliferate — requires the breakdown of glucose. To induce the rapid cellular growth that characterizes cancer, tumor cells turn up the levels of the proteins that move glucose molecules into cells and convert them into building blocks to produce energy that accelerates cell growth. The JGBCC is at the forefront of an effort to develop new classes of anti-cancer drugs that inhibit glucose metabolism. This novel strategy recently led to a phase I clinical trial of a drug that targets glucose metabolism — the first of its kind anywhere in the world. Called PFK-158, the drug works by inhibiting a protein called PFKFB3 that stimulates glucose metabolism in cancer cells and promotes tumor growth. JGBCC researchers led by Drs. Jason Chesney and John Trent demonstrated in mice that PFK-158 blocks glucose uptake by inhibiting PFKFB3’s normal activity, limiting cancer cell growth. Because it inhibits a metabolic process common to most cancer cells, PFK-158 is likely to be effective against a broad spectrum of human cancers. 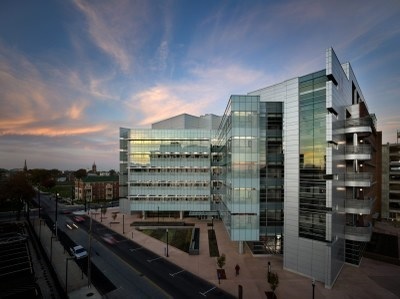 A Louisville-based biotechnology company, Advanced Cancer Therapeutics, licensed and developed PFK-158 which is now being evaluated for activity in patients with skin, lung, colon, breast, and pancreatic cancers at the University of Louisville, Georgetown University and MD Anderson Cancer Center. Although we have multiple specific scientific programs, our clinical and translational researchers are clustered into four areas of cancer research: Experimental Therapeutics and Diagnostics, Tumor Immunology, Cancer Prevention and Control, and Clinical Trials.